eighties, was deaf. It was a secret with everyone. Her TV producer and director knew nothing about it. TV people knew of her deafness! The courts in Japan operate differently from USA. In Japan, lay judges handle non-jury court trials. in the court room. He is Japanese’s first deaf lay judge. interpreters. It is different in New Zealand. 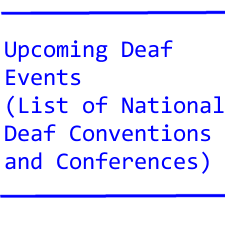 a penny on deaf devices! “Tribes” going on now in an Australian theater. joins the Deaf Community. The father is upset. they laugh at the comedy. — Why was Super Bowl ASL Sing Signer ignored on TV? televised. If she is not famous, the TV will ignore her. Shame on these TV people for their attitude!